I was searching the web for info on a Tappan gas stove that was in the basement of my house (when the house was purchased) when I stumbled upon your website/blog. I don't even know if your doing this anymore, but I am going crazy trying to find someone out there that can help me. 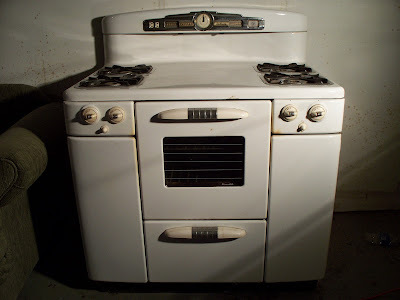 The stove has been in my basement for 5 years now, and I got to thinking that it would look great in my kitchen, but I need to have it restored. In order to do this, I need to know the approx. year of it and who I would contact about restoration. I saw on your site you have helped some people with their questions, and I am hoping you can help me. 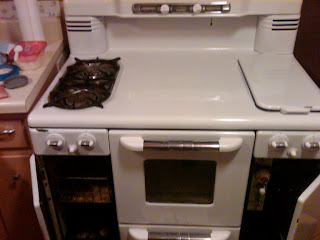 I have attached pics of my stove - the model # is 6V 57 3 and the serial # is 40527. 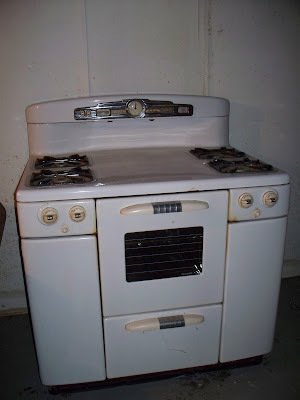 I haven't been able to find anything about this stove anywhere on the internet. I would also love to find a owner's manuel if possible!! Thank you for any help you can provide, it would be greatly appreciated." 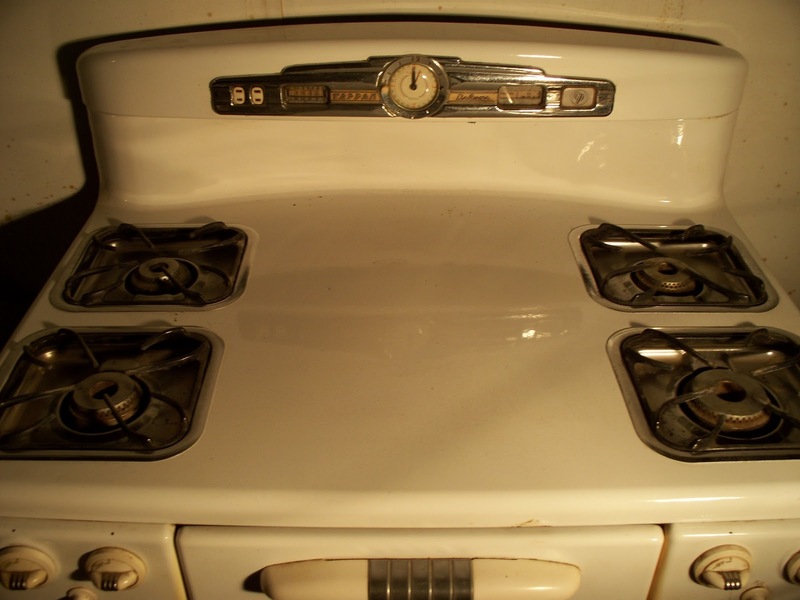 Cherly's stove is very similar to Angie's stove. 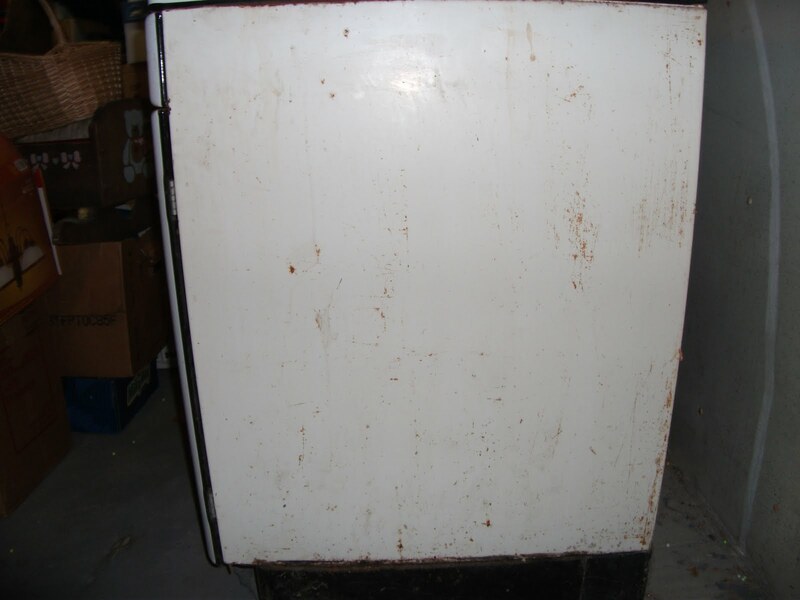 The "cove top" back splash usually indicates the 1940's. 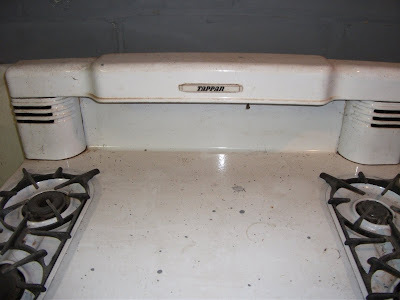 The handles on the stove are a later 1940's version (if you look at some of the other 1940's posts, you can see the earlier handles), Cheryl's stove also has that nice pull out cutlery drawer with dish towel drying rods. As far as restoration companies. There are many to choose from in the south.....but they are pricey. I think most of the folks that stumble on my blog are doing the restoration themselves or piecing out specific parts of the restoration (e.g. 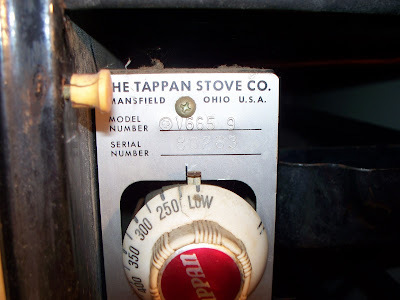 reporcelain, rebuilding thermostats). If you look through some of my older posts, you will find links to some of the resources out there. 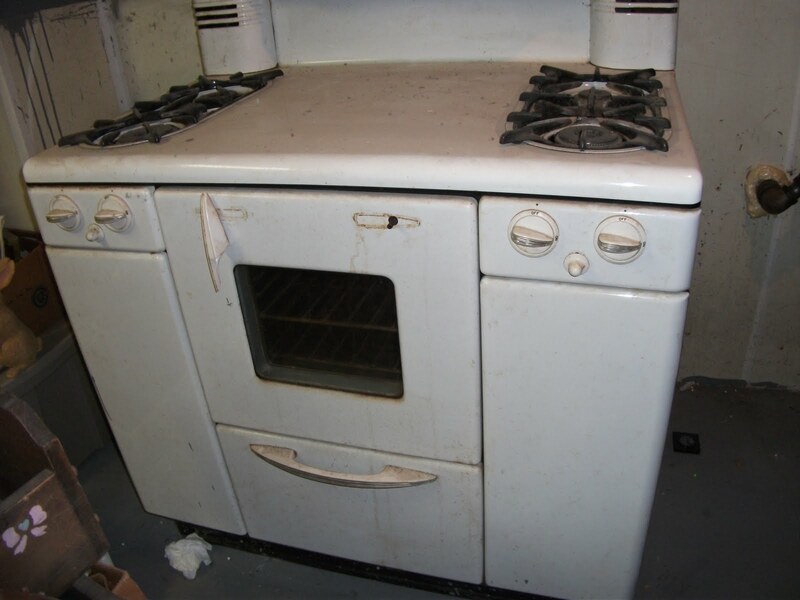 The porcelain on this stove looks to be in very good condition (with the exception of that lower side panel - which may be hidden by cabinetry anyway). One of my favorite tools to clean porcelain has been Clorox Magic Erasers. 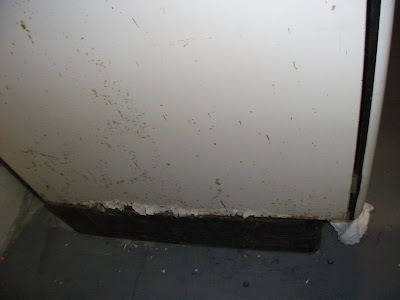 They remove all kinds of gunk without scratching. Ammonia water also works well. If you click on the label "cleaning" on the right hand side of the blog, you will find other tips. 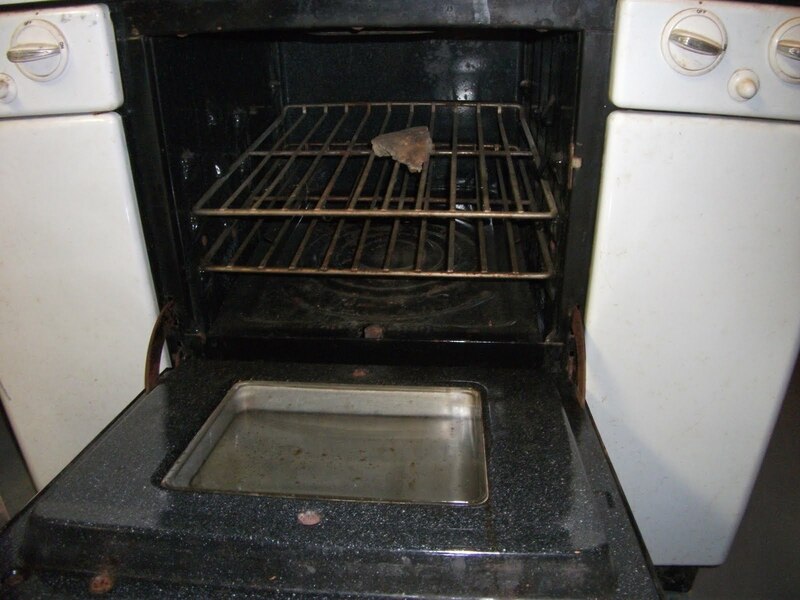 I usually suggest people start with giving their stove a good cleaning.....and then assess it's condition. 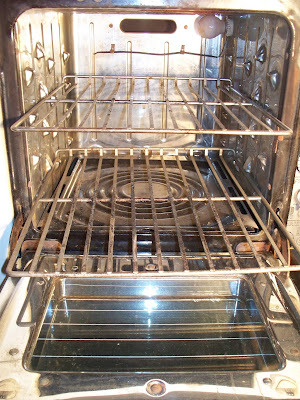 It's amazing how a good cleaning can put things in perspective. Owner's Manuals regularly come up for sale on Ebay for under $10 including shipping. 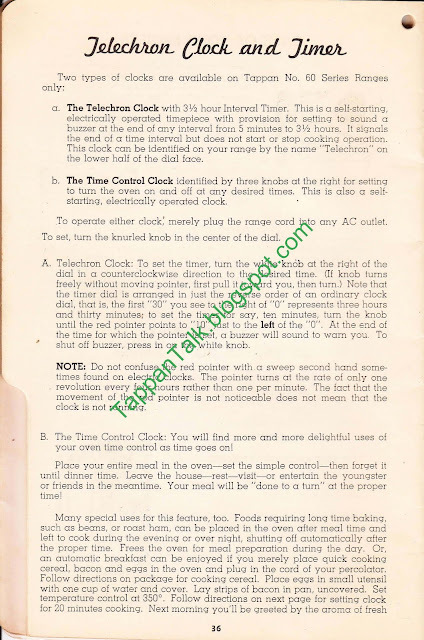 I have also posted (and will continue to do so) pages from various Owner's Manuals on Tappan Talk. Any other tips for Cheryl? Thanks Cheryl for sharing your photos! "I’ve been reading your Tappan blog site for about 2 hours now. Incredibly interesting. Well, my wife and I bought a house on auction, and this stove was in the basement (gas still hooked up). Based on the model number, I don’t see reference to it anywhere. A lot of people on your blog reference similar numbers, but not this exact one; nor can I find anything on this exact model number anywhere else on the web. 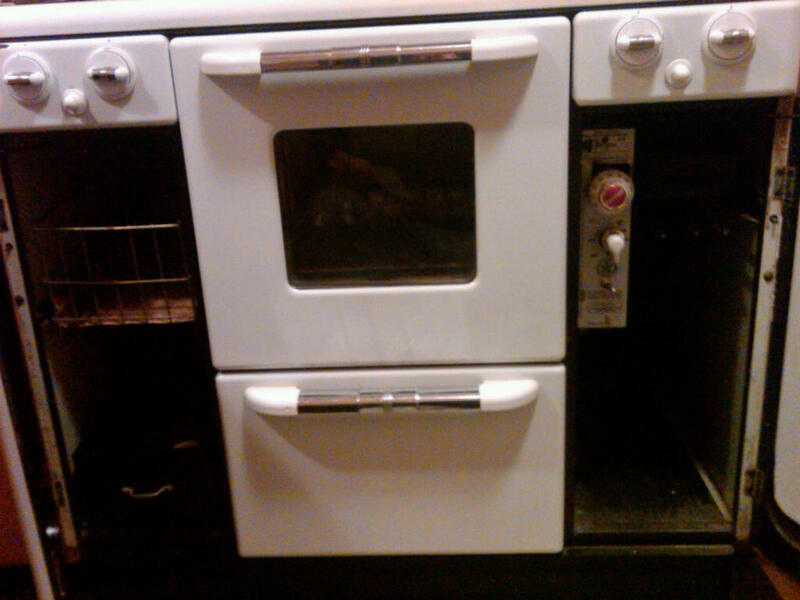 I can send a picture of the model number and serial number if it will help. I’m wondering what is it’s value. 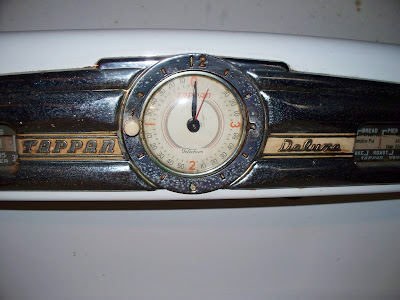 After looking at your blog I now want to restore it and keep it (although it’s still in really good shape)." 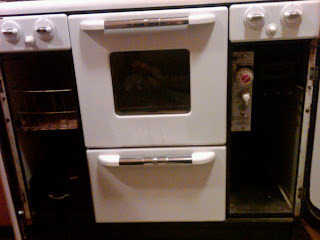 Jon's stove is a CP model (meaning the oven has a standing pilot). 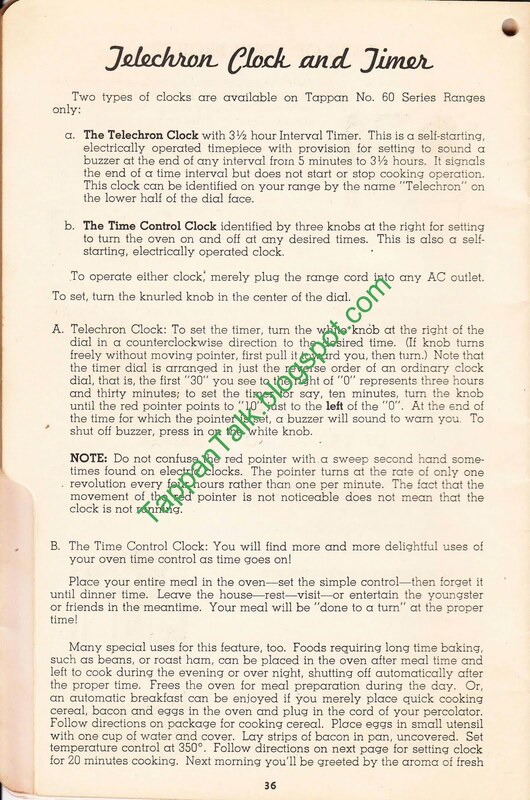 It has a Telechron clock with an interesting twist of having the 3 1/2 Interval Timer. I've added a some info. about how this clock works at the end of the post. His stove looks a lot like mine, but I notice the backsplash light is operated by a knob and not a pull chain which most likely would put it later than 1948. Jon's stove also looks like it has the "gold package" on the backsplash metal. I spotted one other very interesting thing in Jon's photos that we have not seen in any previous reader's stoves. 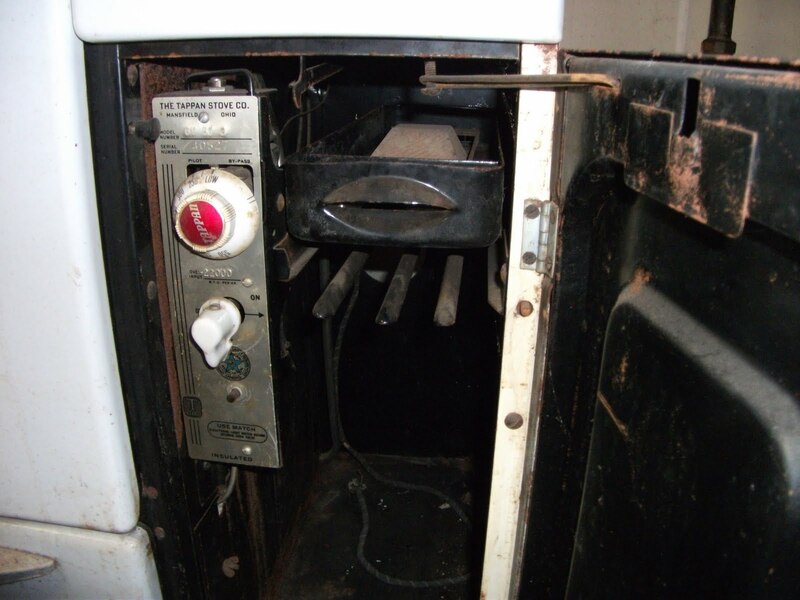 If you take a look at the photos showing the main control panel & thermostat knob, you will see a little white knob on the left side. I *think* this is a pin for a removable oven door feature. If this knob is what I think it is...there is another one on the other side in the same spot in the storage area. 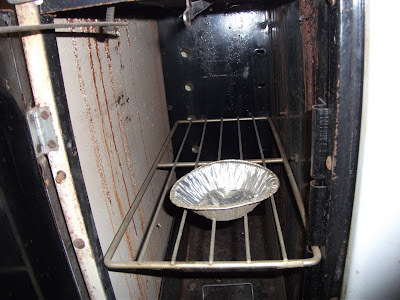 When these are pulled out, the oven door supposedly lifts out for easy cleaning. Hopefully, Jon will let us know. To address Jon's comment about model numbers. I have yet to figure out how the model numbers work on the Tappan Deluxe. 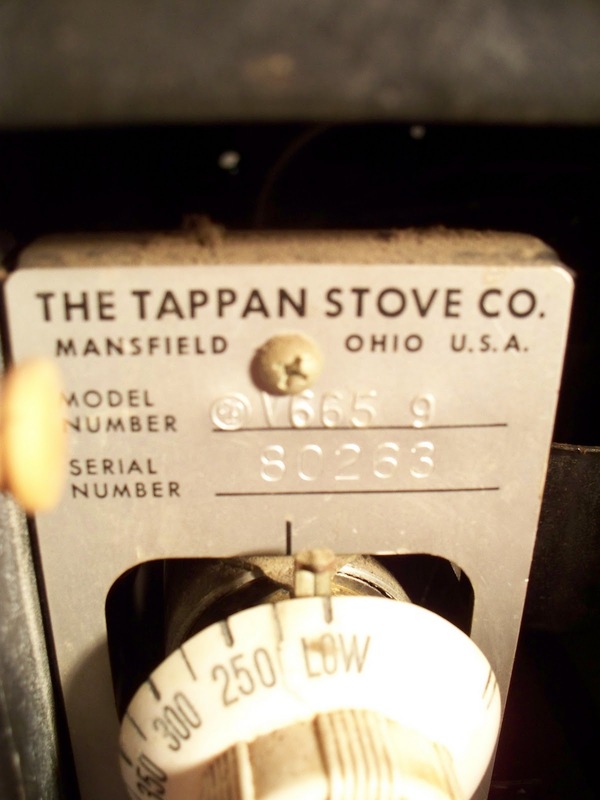 When looking for information about your stove, the only way I have been able to determine model year is to actually look at the features of the stove. There are probably 100 reader's stoves featured on this blog, and I have yet to see identical model numbers between two Deluxe stoves. Todd emailed photos of his Model 1746 Tappan. I'm guessing this is a 1946 Philgas model. 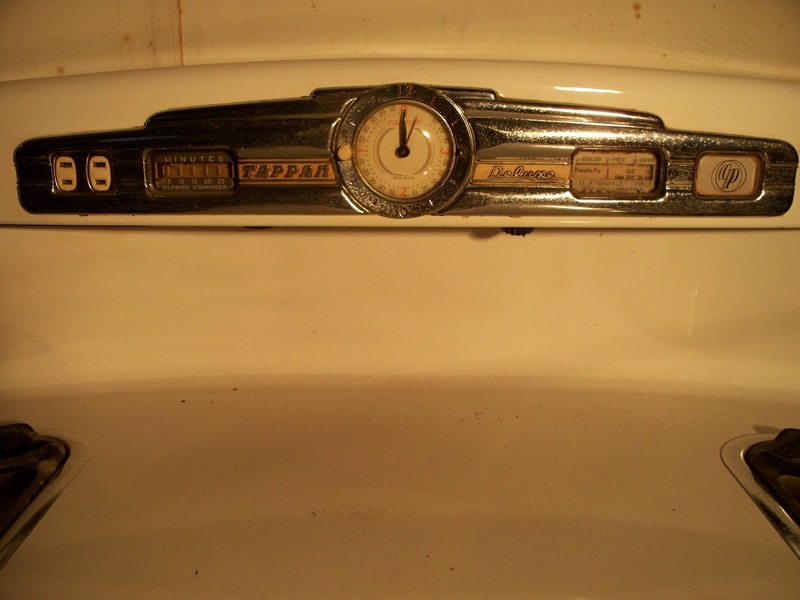 I've learned, by looking through my 1940 and 1941 sales manuals, that in these early models the last two numbers of the model number indicate year. 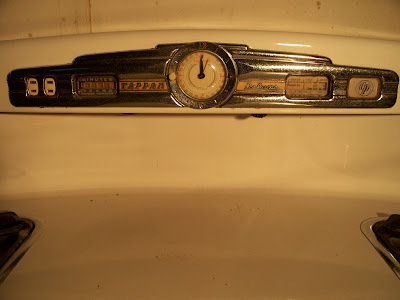 The 1700 series would have been one of the higher end models for that year. "Flush-to-wall design. Divided Cove Top with center working space and built-in Tel-U-Set (Chromo-line edge lighted instrument panel with Visiminder, Visiguide and flood light). Toe-Cove base * Four Chromelite Vitamin-Saver top-burners-giant on left front, standard on right front, two Mighty-Mites at rear-all with new Flexo-Flame lock-type simmer valves. 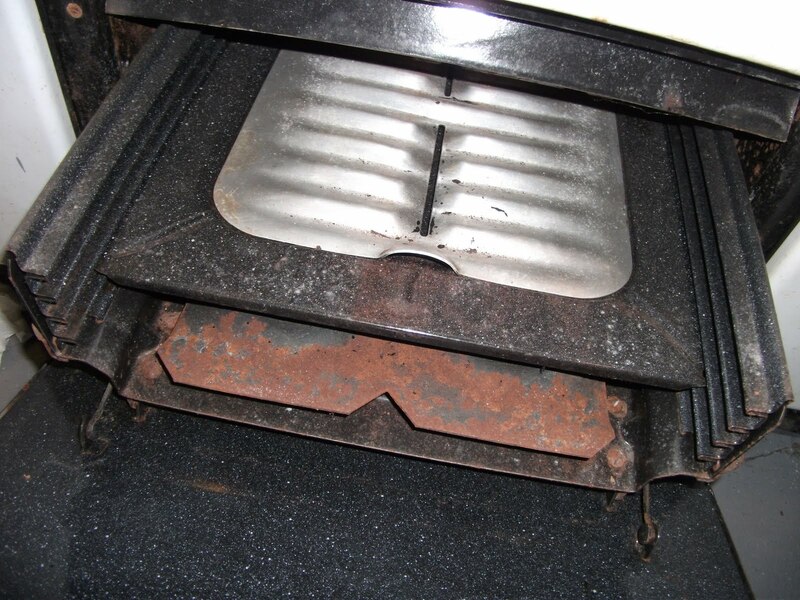 Chromelite reflector drip trays. 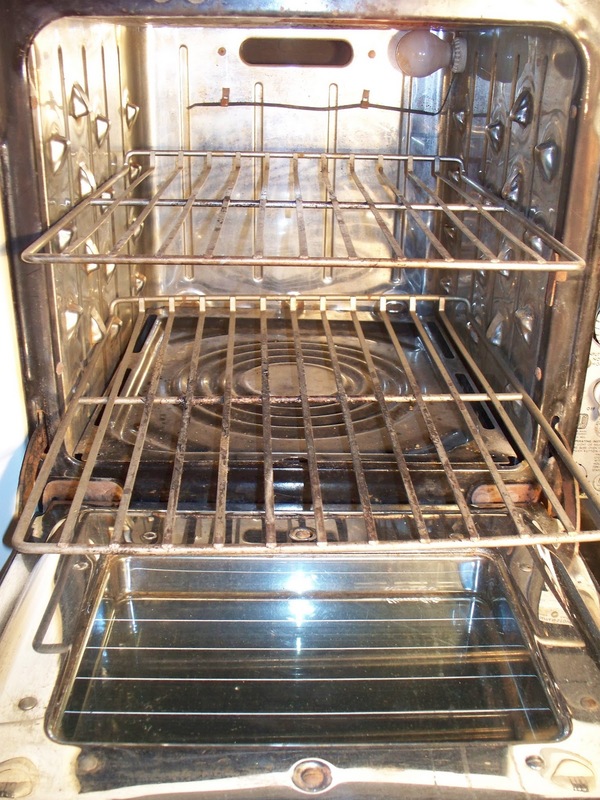 Black porcelain enameled oval grates. Automatic top-burner lighting both sides * Insulated Visualite Flexo-Speed oven with automatic heat control and Sani-Clean chrome lining. Double Tuf-flex glass window. Electric lamp inside oven with exterior "peek" switch. Non.tilt, positive-stop, ribbon racks. Oven-doorstop. 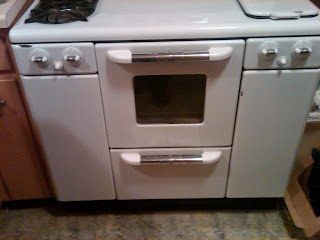 Concealed heat control dial and lock-type oven valve * Drawer broiler, smokeless type, with De Luxe Clean-Quick chromium pan and grid * Two utility compartments with trigger-touch door catches--adjustable wire-shelf in left, cutlery drawer and towel drying rack in right * Finished in white porcelain except white Nubelite body sides and black Ebonite base. 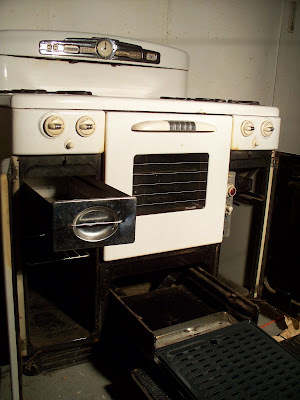 De luxe Chromo-line hardware." Todd, thanks for sharing the photos of your 1940's stove!